1.Color egg shells with egg coloring kits, or food coloring and vinegar (view recipe). You don’t have to color whole eggs for this--you can just use egg shells left over from cooking--rinse and dry them, then color them. You can leave them in big pieces and let the kids break them up smaller. 2.Provide black cards and white glue (that dries clear) for kids to press the egg shells onto. 3.Alternative method: Let kids glue broken shells onto a background, then color them with permanent markers. 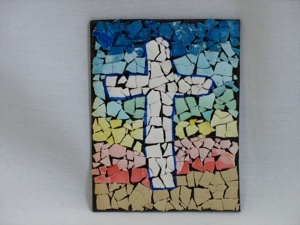 A cross with a sunset background is probably the simplest design, but older kids could make an empty grave scene instead. 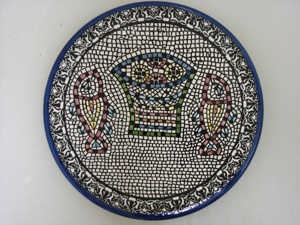 Imitate this mosaic plate that looks like a mosaic found on an ancient Roman floor. Provide black paper plates, or black construction paper circles (the smaller they are, the less time they will take to make!) 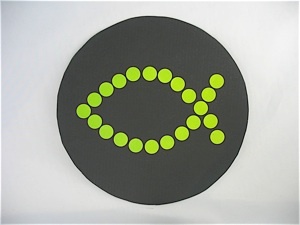 Make a sample that the kids can follow, and simplify it to make it a quicker project--only one fish, use bigger stickers, or don’t fill in the empty spaces. 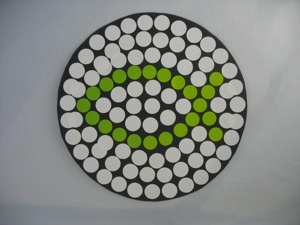 Provide several colors of dot stickers found in office supply stores and dollar stores. 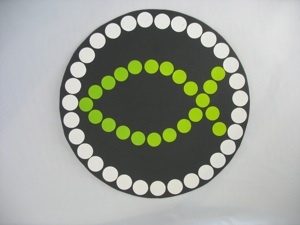 Draw an outline of the fish so the kids know where to put the stickers. If they do fill in the spaces, there will be some spaces that are not big enough for whole stickers. Encourage the kids to overlap dots that are the same color to fill these spaces rather than cutting the stickers to fit.